There is no better cancer gift than one that empowers the mind to overcome. Our original decals are inspired by antique apothecary labels, and are a “re-MIND-er” to shift from a mindset of fear and anxiety to one of healing and vitality. Dhremo Kids allows your child (or a child at heart) to tap into their inner super powers and imagination to aid in their healing. Each set includes 5 decals: Miracles, Hope, Vitality, Love & Light, and Clarity. Simply peel and stick each directly onto the back of your IV bags. Our pediatric line serves as a powerful visual and mental aid, lowering fear and aversion to chemotherapy. This helps children (and caretakers) re-frame the experience, focusing instead on positive, healing and empowering thoughts during treatment. Five designs include: Wishing Well Tonic, Bravery Elixir, Sunshine Sparkles, Rainbow Cure Blaster, and Strength Activating Serum. There's even one you can design yourself! With Dhremo, Chemo doesn’t have to be a nightmare. In fact with a little imagination you can transform your infusions into magical potions that will blast cure sparkles throughout your entire body! Want to offer a Dhremo Therapy program for your patients? You can now order bulk decal hospital kits including 25, 50 or 100 of each of our pediatric or apothecary decal designs. Like all of our products, 10% of profits are donated to cancer research and support organizations. Laminated Decal Menu - to take to patient bedside to chose a decal design. Safety & Usage Directions - Pharmacy developed instructions for nurses. Nurse Training Video – Utilize our 5 minute training video for oncology nurses on safety and usage directions as well as suggestions on introducing decals to patients. Plastic Sealed Case - For easy access and storage of decals. Direct Support – work with Heather, our Clinical Integration Specialist to integrate Dhremo into your hospital or infusion center. Our thoughts are powerful. Drink in health, vitality and expect miracles with every sip from our 16oz glass water bottle. Express gratitude with our 5" x 7" lined journal. 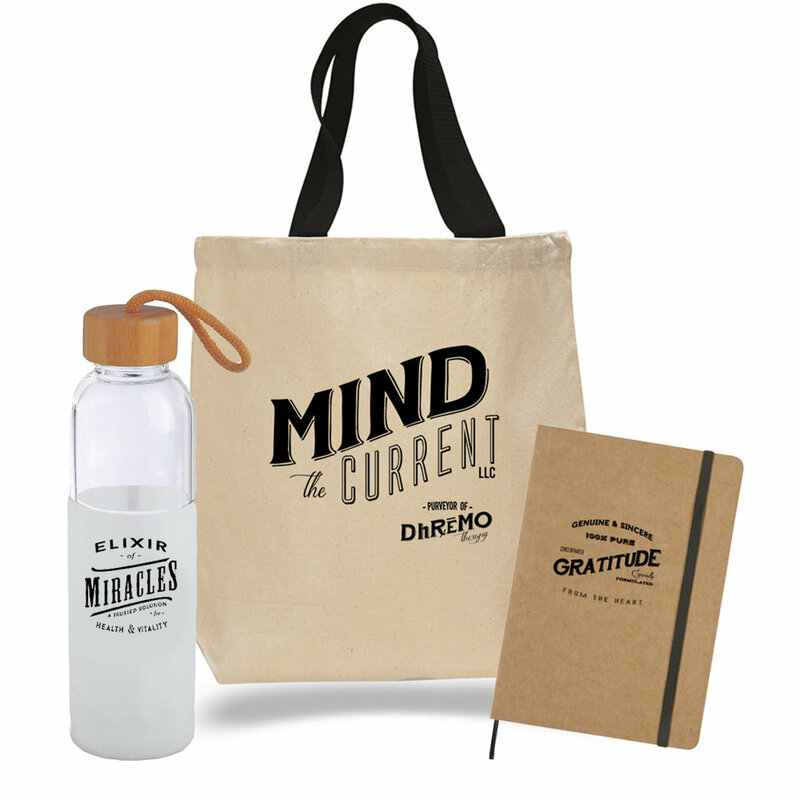 Or simply remind yourself to be MINDful of all the things you carry with our classic tote. All items in our Mind The Current line are reminders to tap into the meaningful undercurrent so often lost in busy minds and busy lives. What a great gift to anyone you want to uplift. Bring our products to your gift shop or boutique. Click below for our line sheet, prices and minimum purchase requirements. © 2018 Mind The Current, LLC. All rights reserved.